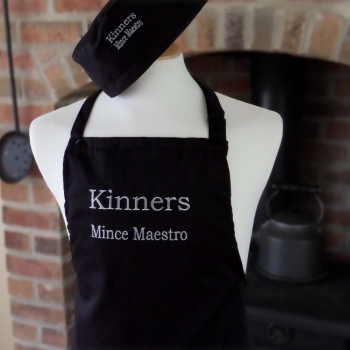 Black Personalised Chefs Apron with a name or initals mongrammed to make a truly special gift. Black Personalised Chefs Apron with a name or initals mongrammed to make a truly special gift. Unique and useful gift idea for men and women and suitable for any occasion or holiday! Choose the Text. Black Personalised Chefs Apron with a name or initals mongrammed to make a truly special gift. Unique and useful gift idea for men and women and suitable for any occasion or holiday! Choose the Text. Choose the thread Colour. We will produce your gift especially to order and ship your unique gift to you or your chosen recipient. We use quality polycotton high performance aprons made using a sturdy polyester and cotton blend for durability and easy care. Has neck strap and long waist ties so you can adjust to fit most all adults. Great for light to heavy duty cooking, professional catering and chefs, or just cleaning or barbeques! Measures approx 72cm wide x 86cm long. Would you like to add to your order a matching Chefs Skull Cap? Tick the additional option and we'll embroider a name, nickname or initials to match your personalised apron. At Amys Gifts we do all our own embroidery work especially made to order and do our best to get all orders dispatched within 48 hours, however it may be necessary to allow a few extra days near holidays.